If you are already familiar to this US band from Maryland, then you know that this is not a new album. Shadow Kingdom Records is re-releasing IRON MAN's second full length album accompanied by a live recorded DVD that easily could be characterized as ‘bootleg’. In "The Passage" there is an 'expired' lineup, since only the founding member and guitarist Alfred Morris III is still with the band and more than a decade has passed from those days. So, this re-release is an introduction to the band's first days and hence the more raw sound. As the band's moniker implies, BLACK SABBATH (of course of the early Ozzy days) is the main -if not the only- influence for IRON MAN. Consequently, "The Passage" is a traditional doom album following the recipe as introduced in the first SABBATH albums. In order to understand my thinking ‘traditional’ doom according my personal standards is what BLACK SABBATH and the following CANDLEMASS were doing back in the old days: low tempo riffage, clean and fair vocals and a blow-minding bass that competes with drums for whom is going to be the 'winner' in this eternal 'battle'. Dan Michalak's voice established IRON MAN to the crowd's conscience and placed the band on the highest step of its career since the fantastic "Submission" Ep that came up later. But that's another story. 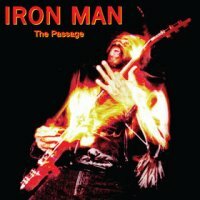 The bonus DVD that comes along with this re-release of "The Passage" contains some vintage stuff from two IRON MAN's live appearances from the late 90s in Virginia and Maryland. The production and the visual result are really awful but this is about a 'true' appearance in front of a bunch of people and addresses to the fan base of the band, so it could not be judged for the lack of high quality and professionalism. In general, the entire "The Passage" 'package' is a nice opportunity to those who don't know IRON MAN to learn about their past. For the rest, is a necessary stuff to enrich their music collection with this SABBATH-esque treasure with the signature of Shadow Kingdom Records, especially for the doom Metal fans.